Style in Harmony: V-Day Gift Ideas for Her! 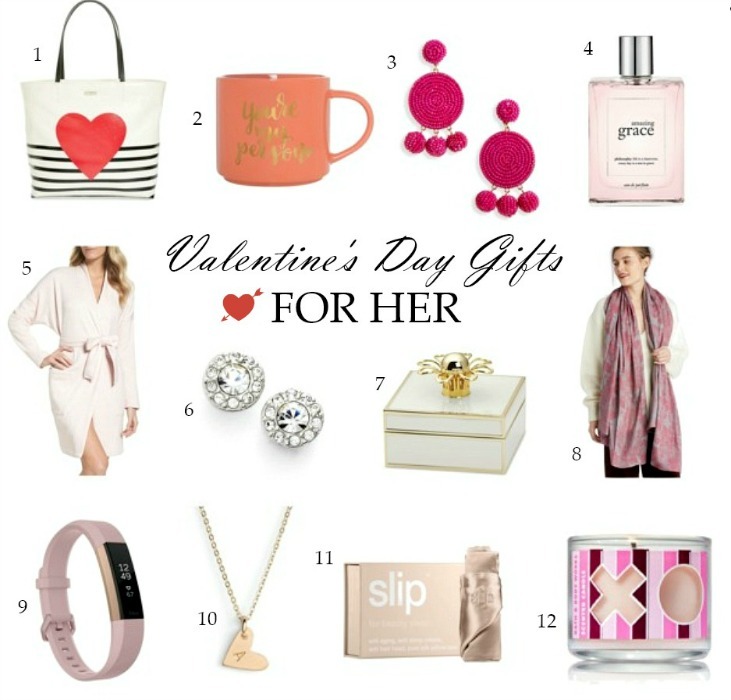 V-Day Gift Ideas for Her! I love this tote...it's too perfect for V-Day! How cute is this mug!? These are SO pretty. They come in 7 colors and are a great affordable jewelry gift! I love the Amazing Grace collection. This perfume smells SO good and you can't go wrong with this gift! This is a pricey robe, but it looks SO soft and is a really nice gift for a special occasion! These are GORGEOUS and look way more expensive than they are! I think a jewelry box is a nice gift for any girl! This one is part of a really pretty Kate Spade home collection. Make sure to click on this for a closer look. The print is so feminine and pretty for spring! For all the fitness gurus in your life. I love the rose gold color of this special edition fitbit! This is such a beautiful, dainty necklace and a piece of jewelry that won't break the bank. These pillowcases are pricey but get raving reviews for protecting hair, reducing split ends and making a blow out last longer. It's also supposed to keep moisture locked in your skin overnight and be anti-aging and anti-sleep crease. I've been LOVING burning candles lately! Ever since the Christmas season, I've been quickly burning through my favorite candles. It makes our home so cozy and welcoming! This candle is really cute. It also comes in a 2-pack available on Amazon, which is a nice option since they are so small. Whether you're shopping for gifts for your girlfriends or plan to give this list to the special guy in your life (insert winking emoji), I hope it was helpful! Thanks for stopping by!